You didn't think I meant Emma of Altdorf, Queen of the East Franks, did you? What do you want from me? And, what kind of royal title is Queen of Franks, anyway? In the Kingdom of Oscar Meyer, perhaps? I'll take Queen of the Road any day, thank you very much. Especially since one of Emma's sons was known as "Charles the Fat." (Yeah. Try getting away with that in my kingdom.) Must have been all those hot dog buns. 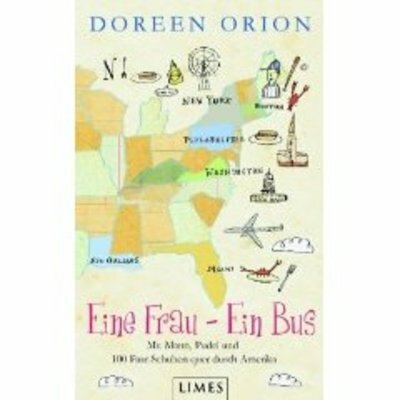 The German edition of QUEEN OF THE ROAD just came out. It's called, A Woman - A Bus: With Husband, Poodle and 100 Pairs of Shoes Across America. And I thought I was bad at titles. (OK, and here I'm going all Jewish mother on you): At least the cats aren't alive to see themselves left off the cover! Seriously though, I do love the way the book looks and feels, as well as the cover art. If any German readers come to the blog, I'd LOVE to know how "Project Nerd" was translated. A Manhattan Princess in a mobile dwelling. Doreen and Tim Orion [Tim just LOVES being called, "Tim Orion"] keep up a wonderful marriage, even when they both are diverse beings. Until Tim had an idea: He wants a refurbished bus to take a trip through the USA. A Royal Wave-Out to the Queen Mother for Yiddish, as well as German Dictionary support, and especially Prince Henry (I almost called him, "The Queen Father," but that's kinda like calling my husband, "Tim Orion") for the actual translation from German to English. 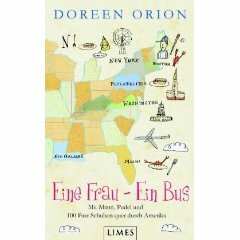 Just recently i bought your book in german (although i am definitely going to buy it in the original version, i think, your humorous style must be read in english) but nevertheless: i love your book! And you have to admit, you loooove to shop! (At least, that's how you describe yourself...) And you are a princess. So! And you of course sit in your refurbished bus, together with your husband, two cats, a giant poodle. In german we say "one sits in a vehicle and does this and that" Written in correct english it of course has to be "one drives in a refurbished bus and does this and that". It's just a matter of linguistic specifications, thats all. No Tornado is mentioned, though! And no nudist camp, either. I can't find any murder suggestions as well - but maybe you have another description of the book or it may be a good idea to check with the person who translated this text for you.... just a suggestion. "Under the surface this relaxed description of a crazy trip over the Highways and Sideroads of America creates the portrait of a married couple that goes through any ups and downs with humour and mutual understanding"
Thanks so much for your lovely comment on my blog. I really do appreciate the translation. Part of the issue with the one I posted, is that my dad did it from the publisher's description on the book's Amazon.de page, as he didn't have the book itself. (And, another issue may be that even though he's a native German speaker, at 88, he hasn't read or spoken it in awhile.) If you go to that page, you'll definitely see Bill Bryson mentioned, although I have no idea what the words for "tornado" or "murder" are. I love that Elle Magazine quote, too. If you get a chance, I'd love to know how "Project Nerd: Domestic Superhero" was translated in the book. I'm very touched that you plan to read it again in English. Even my own father only read it in one language! If you'd like a signed bookplate for your copy/copies, please email me your address, the names you'd like it/them made out to, and I'll send my "driver" to the post office. Thanks so much again for your lovely post and... Queen On! I have to admit, I was flattered that you actually not only read my comment, but answered it, too. Thank you! In the meantime I read the Amazon discription. And I have no idea, what they are referring to when writing about "tornados" and "murdering your spouse". I certainly did not want to offend or disrespect your dad's translation! I must have overread that fact in the first place. Nevertheless, I understand, if one does not practice a language, even if he's a native speaker, some subtleties just fade from one's memory. I love to read english books! First and foremost, that is an excellent way to improve my vocabulary. And second, most translations cannot catch up with many typical english/american phrases. And the transcription into typical german phrases often lacks the original humor. I am going to visit the US in June and one of the first things I am going to do is go to Barnes & Nobles for a Copy of your book - and at least 10 other books and DVDs. Thank you again for your kind answer to my posting! No offense or disrespect taken! Got your address. Tim tells me he's going to the post office in a week or so, so I'm sure you'll get the bookplate soon. I love that you'll show around your signed copy. Word of mouth is the best buzz for books, and it's really because of my wonderful readers that the book is in 7th printing here. This page contains a single entry from the blog posted on March 18, 2010 3:04 PM. The previous post in this blog was Homer City Book Ends. The next post in this blog is River City Readers.